Where do I use my Arena Flowers voucher code? Arena Flowers allows you to express your emotions and feelings with a stunning flower arrangement which speaks a thousand words. The wide array of different bouquets available are all perfect in showing the people dear to you just how special they are and make the perfect gift. Flowers can help you express your support, how proud you are, or how much you love someone as well as be the perfect thank you or celebratory gesture. Show someone just how much you care about them with a bouquet from Arena Flowers and make great savings when you shop online. Using a discount voucher code from Arena Flowers is a great way to save money on your order. Codes offer a discount on select products such as "15% discount on New Ranges " or "Save 15% on Valentines Day Orders" or give you a generic saving e.g. "12.5% off your order at Arena Flowers." Simple input your discount code at the website's checkout page to see your instant discount! 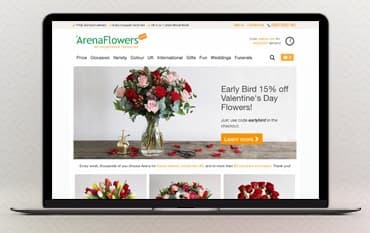 Always remember to check here at Netvouchercodes before you place an order to see what discount codes or money saving offers are available at Arena Flowers. Arena Flowers specialise in providing gorgeous, individually designed wedding bouquets for brides and their bridesmaids. Choose from simple, elegantly wired bridal bouquets to more traditional or contemporary hand-tied bridal flower arrangements, Whatever your choice for your wedding bouquet, their expert team of wedding florists will listen carefully to your needs to create stylish bouquets that meet your requirements right down to the last detail. They can also provide buttonholes, corsages, table decorations, cake decorations and floral displays for your big day. Arena Flowers deliver high-quality hand-made funeral arrangements anywhere in the UK. They can cater for all of your funeral floral needs from sympathy bouquets for the bereaved to funeral wreaths, funeral sheaths and floral tributes to Funeral Casket Arrangements. Whatever flowers you decide on, Arena Flowers guarantee that we will deliver what is required, so you can order with confidence. Their customer service representatives will guide you through the process of your funeral flower arrangements to make sure that your funeral flowers arrive exactly when and where you need them to. At Arena Flowers, you can find beautiful bouquets for every season and any occasion! Everything at Arena Flowers is handpicked and the expert team of florist know just how perfect they have to look, especially when they're a gift for someone special! Browse the stunning collection available at Arena Flowers featuring all your favourites from Lilies to Orchids, Carnations, Roses and so much more! From Birthday's and Anniversaries to wedding arrangements, celebratory flowers and flowers to simply say thank you; there is bouquet for every occasion at Arena Flowers.